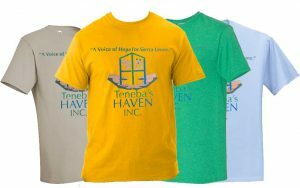 These colorful t-shirts are available now for purchase for only $10 (plus shipping & handling). This is a great way to show your support for the people of Sierra Leone as the sales from these t-shirts will go to funding the life-changing projects we are starting and maintaining in Sierra Leone. All purchases will be given a receipt to record your charitable giving.